International Jewelry Design, Inc. has launched DBW Jewelry -Design. Build. Wear. 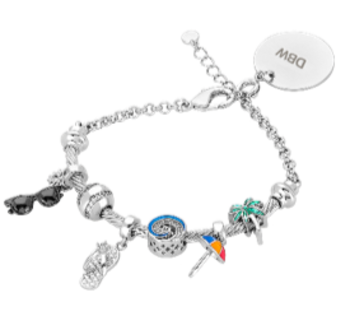 â€“ A refined line of fashionable and customizable collection of charm bracelets and bracelet accessories, available now to both their B2B retail customers and the general public with a full direct-to-consumer, interactive e-commerce site. DBW Jewelry features an ever-growing line of unique interchangeable bracelets, bangles, charms and beads designed with self-expression at the forefront. As is their specialty, IJDI created a dazzling point-of-sale display for DBW Jewelry with a video of the digital bracelet builder that walks customers through the customization process. Retailers are also ecstatic over the magnetic interchangeable display pieces so thoughtfully created by the jewelry showcase gurus. Online, the bracelet builder is fully interactive, and visitors get to design their perfect piece through their choice of everything from the bracelet bar and chains, the desired weighted inspirational hang tag, and the chance to place beads, spacers and charms on their bracelet digitally to see what it will look like all together before purchasing. DBW Jewelry launched the initial collection with pieces that range in theme and style to encompass the interests and milestones of women from all walks of life. The brand is already working on expanding the line before summer 2019.